Oregon’s high-technology sector is being disrupted. 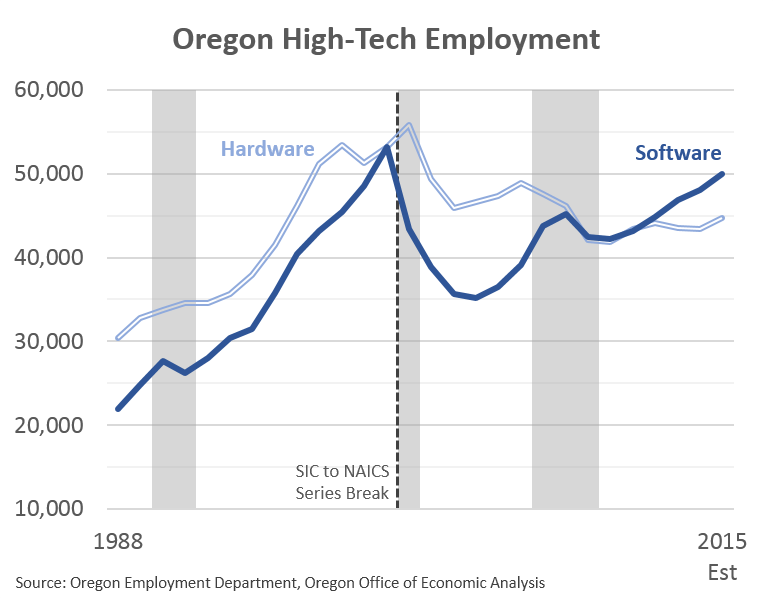 Industry growth in the past decade is entirely concentrated in software, while Oregon’s historical strength in hardware is no longer the driver of job growth. Hardware remains the state’s comparative advantage, pays a large number of employees very high wages, and drives much of the state’s GDP growth due to its productivity. However, relatively flat employment in hardware — like manufacturing overall — has been, and is the new up. Conversely, software companies are driving job growth in the sector, much of which is concentrated in Multnomah County. See here for more on the sector definitions. The Oregonian’s Mike Rogoway has two recent interesting articles on this software growth and the fact that many of these firms are outposts, or non-Oregon headquartered firms. Underpinning his interesting articles is work our office has done, but only with the help of our friends in Research at the Employment Department and in Research at the Department of Revenue. To help understand the outpost topic a bit further, we asked Mary Fitzpatrick at the Department of Revenue to crunch corporate tax return data for a core set of high-tech industries. She was kind enough to run through all the tax return data and match it up with withholding records for a few different years. 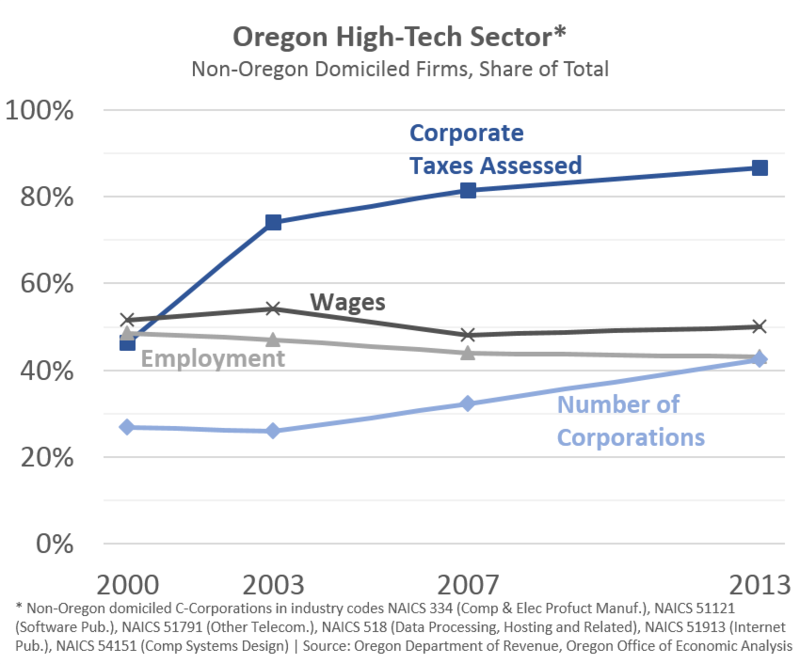 The graph below shows the non-Oregon domiciled firms’ share of the tech sector total. Essentially, it shows what share of the total is from out-of-state companies. Due to the lagging nature of corporate tax returns, the latest year available is 2013. This predates many of the software outposts, however the graph will serve as a historical baseline moving forward, from which we will compare trends. Thanks Mary! There is one big caveat here in that these calculations exclude Intel. This was my decision and done on purpose for a few reasons, see note below for why. What Portland doesn’t have is a single big-name tech company of its own. Even growing outposts are less likely to house the highest paid jobs at most companies, they don’t provide the economic spillover that locally run technology companies do and they may be less likely to engage in philanthropic and community activities than locally run operations. And Oregon knows from painful experience that when times get tough the outposts are the first to feel the pain. Hynix’s factory in Eugene went vacant for seven years after the chipmaker shut it down and laid off 1,400; Hewlett-Packard has been downsizing campuses in Corvallis and Vancouver for years. Any potential concern comes from the headquarter hub versus spoke issue. During the next downturn, or any high-tech industry correction, to what extent will the companies downsize or cut their spokes (outposts)? Typically, headquarter operations perform the best and firms consolidate to gain efficiencies during tough times. This means cutbacks or closures in the outposts. Ultimately, [State Economist Mark] McMullen said, Portland needs a cluster of homegrown skills that can sustain the local scene when the corporate parents’ fall on hard times. “The hope is we can get the foundation built before, inevitably, they pull back,” he said. Oregon’s reliance on tech outposts “is not optimal,” in [Elemental Technologies Sam] Blackman’s words, but the recent spate of deals doesn’t necessarily make the issue any worse. It’s bringing money and jobs into the local economy, he said, and setting up entrepreneurs to start again with new companies. That very last part of what Mr. Blackman said is really important. Essentially, has software in Oregon reached critical mass? Oregon started from a very small software base just a few years ago (unlike hardware) and is growing very quickly. The concern is whether or not Oregon’s software sector can rebuild and thrive following the next downturn, or will the workers leave when the jobs dry up? 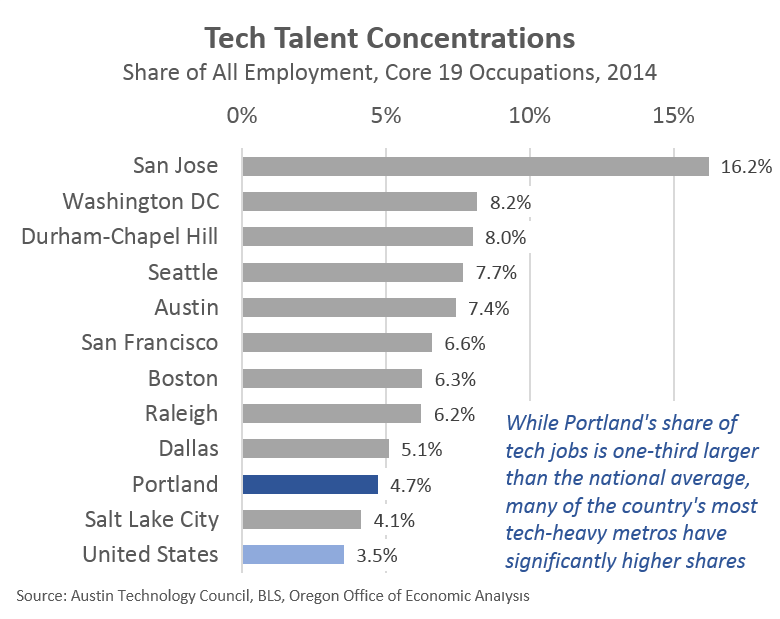 We know that Portland’s tech talent cluster is both significantly above the U.S. average but below the country’s largest tech centers. Portland ranks 14th highest among the 50 largest MSAs in the country. The regional economy is obviously better off with a more diversified base, including these good, high-paying jobs. With the software sector hitting critical mass, and the broader cluster thriving today, this should be the case moving forward. Note: The evolution of Intel here in Oregon is, in my mind, well known. Their employment totals, big investments in new facilities and the like are publicly known and regularly discussed when it comes to the Oregon economy. Given the company is the state’s largest private employer (across all industries), they dominate the numbers when focusing on just one portion of the economy. While it is hard to undersell the importance of Tektronix (historically) and Intel (today) to the regional economy and growth in the high-tech sector, the main purpose of this research is to try and examine how everyone else is doing. Exuding the large outlier from the analysis helps focus on the underlying trends impacting the other 3,300 or so companies.